As cars get ever more technically advanced, it's important to look back and see the roots of what we now take for granted — and maybe find old ideas with modern relevance. These are Jalopnik readers' choices for the most advanced cars in each decade of the past hundred years. What Was The Most Advanced Car For Its Decade? Welcome back to Answers of the Day — our daily Jalopnik feature where we take the best ten responses from the previous day's Question of the Day and shine it up to show off. It's by you and for you, the Jalopnik readers. Enjoy! Why it was state of the art: Early automobile controls were a jumbled hodgepodge of levers, pedals, cranks, slides and indicators that varied wildly from vehicle to vehicle. The Type 53 rationalized the entire mess and implemented the standard vehicle-control layout that persists to this day. Other significant features included such advances as an early V-8 engine and an electric starter. Why it was state of the art: Vincenzo Lancia deserves far more recognition than he gets for the technical prowess of the products that bear his name. The Lambda pioneered two major technical breakthroughs: the car's structure was a monocoque/unibody, extraordinarily stiff for its time, and the wheels were sprung independently. The oddly sleek machines were a major step forward in handling and roadworthiness. Why it was state of the art: The coffin-nosed Cords were Art Deco shapes wrapped around high technology: front-wheel-drive, preselector gearboxes, superchargers on the 812, advanced suspensions and safety and convenience features like variable-speed wipers and a radio. The disappearing headlights aren't notably advanced technically, but aesthetically — like the rest of the car — they were groundbreaking. Why it was state of the art: Preston Tucker's huge, radical aircraft-influenced sedan was a monument to progressive thought and intelligent engineering. Only 51 of the rear-engined, independently-suspended cars were built before the company was overcome by financial crises — propagated, many say, by the powers in Detroit that were intimidated by Tucker's ambitions. Why it was state of the art: Everyone's favorite Gallic starship remains one of the most ridiculously overengineered and technically ambitious vehicles to see mass production. While Detroit was busily futzing with tailfins and chrome, the French redefined automotive luxury. Some say the DS's systems were a technological dead end; some say everyone else is still catching up. Why it was state of the art: This slightly oddly-proportioned sedan was a repository for every advanced idea about car tech in the late Sixties: Wankel engine, front-wheel-drive through a semiautomatic gearbox, four-wheel disc brakes, a long wheelbase with tons of interior room, surprisingly good air-drag figures. Reliability issues, especially with the early Wankel, damaged its reputation but not its influence. Why it was state of the art: Saab was one of the very few automakers whose products actually got better and faster and more interesting during the Malaise. 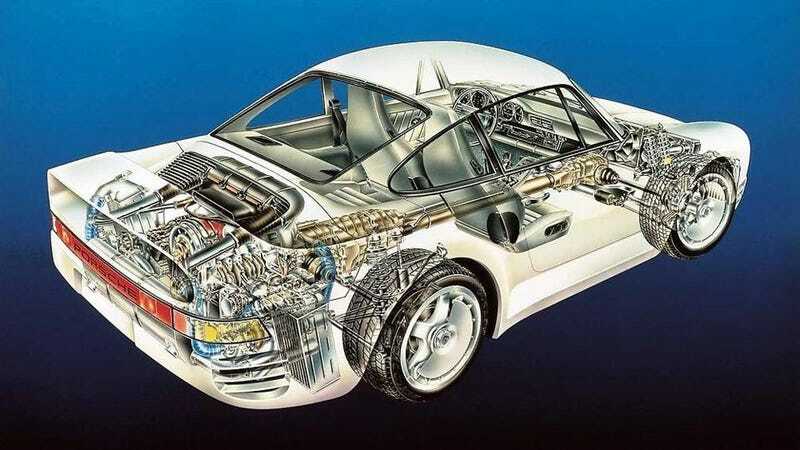 The 99 Turbo was their statement of intent: the fuel-injected four with its very advanced turbo system powered an odd-but-pleasant-looking car that combined levels of comfort, practicality, and safety that set benchmarks then and are still respectable today. Why it was state of the art: When the Porsche Gruppe B show car was displayed at the Frankfurt show in 1983, it was so advanced that it was hard to take seriously. When the production version was released in 1986, complete with torque-vectoring all-wheel-drive and composite body panels and an engine once removed from a 962, it was still playing its own game. Twenty-five years later other companies are just starting to match it. Why it was state of the art: Not as complex as the 959 but several steps forward in other ways, the F1 remains Gordon Murray's masterwork. The carbon-fiber chassis holds an enormously powerful BMW V-12 with pioneering variable valve timing, a fascinatingly compact gearbox, a perfectly tuned suspension...and very little else. It was so focused that the race car did not differ materially from the street car. In our current age of computer overload, the F1 is a lesson in high tech in service of purist intent. Why it is state of the art: As automakers begin to investigate a world past fossil fuels, the most advanced cars on the road today are the ones that look to very different propulsion systems. As batteries continue to have frustrating limitations, fuel cells are showing more promise. The brilliant part of the Clarity is that it packages this tomorrow-tech in a rather normal-looking and normal-driving car; it's progress without discomfort. Photo Credit: American Honda Motor Company, Inc.